This was what the Nazi’s said. Why they were able to do horrific things to their fellow citizens. They were just following orders. Well TSA agents are just following orders. I watched the pictures below. People submitting, a child with a grown man who’s hand is passing over his leg and possibly genital area. A woman who has her hand in between another womans breast. Another person who has her hand close to another womans posterior. 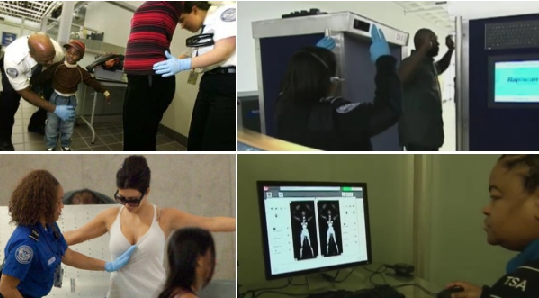 Then the TSA agents who are telling people to stand with their hands behind their heads, and I realize much like Nazi Germany, they are just following orders. The orders are much more mild now, but this is how it begins. You start with small commands, and then eventually you can escalate to horrific commands, and the people are just so use to doing what they are told, and following orders, that no one notices when the line get’s crossed. In the video what starts off as a simple strip search call prank, leads to a full scale sexual assault. The insanity could have been stopped at anytime by either the victim or the perpetrator, but both were too accustomed to following orders of an authority figure. Under normal circumstans any male in our society would know better under most circumstances to never, and I do mean never be in such close proximity to a child, and never have your hands roming below the waist in such proximity, but under these new guidelines the TSA agents are just following orders and doing what they are told. So the question is, if they are told that they must do a naked pat down someday, will they follow the orders, touch naked body parts, will they still follow the orders? How many of these agents will be abel to step out of line follow their conscience do what they know is right and stop following these orders? If the social psychology experiments are any indication, not very many, and no matter how horrific the orders get, the compliance will continue and that is how you train up a society to go along with horrific things.